This past Christmas, I wanted to try I new treat. I do this every year, adding a new cookie to the growing list. This year I did something slightly different. 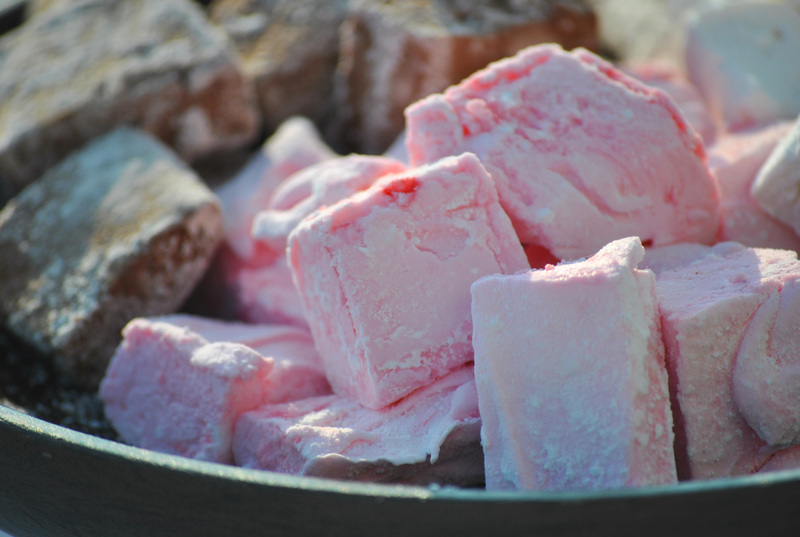 I made peppermint marshmallows. I’ve always wanted to try making homemade marshmallows and thought Christmas was the perfect excuse to do so. I made peppermint marshmallows and put them on sticks, put them little bags and decorated them with a ribbon. Putting them on sticks made them easier to add to hot chocolate. Since then, I’ve made them again for our girl scout fondue night. This time I used a different recipe which has become my go to one. 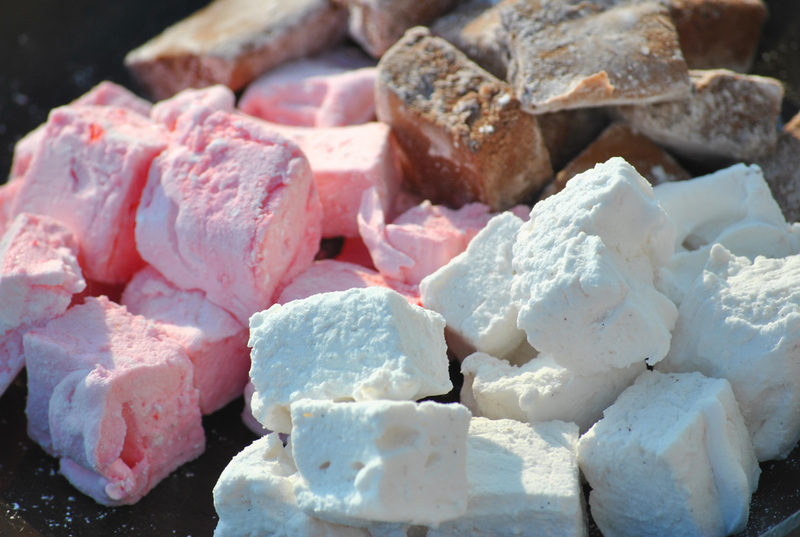 Once you make marshmallows, the options are endless. There is a peanut butter and jelly marshmallow that I really want to try. Oh, and if you are like me, not much of a marshmallow fan, then you truly must try these. 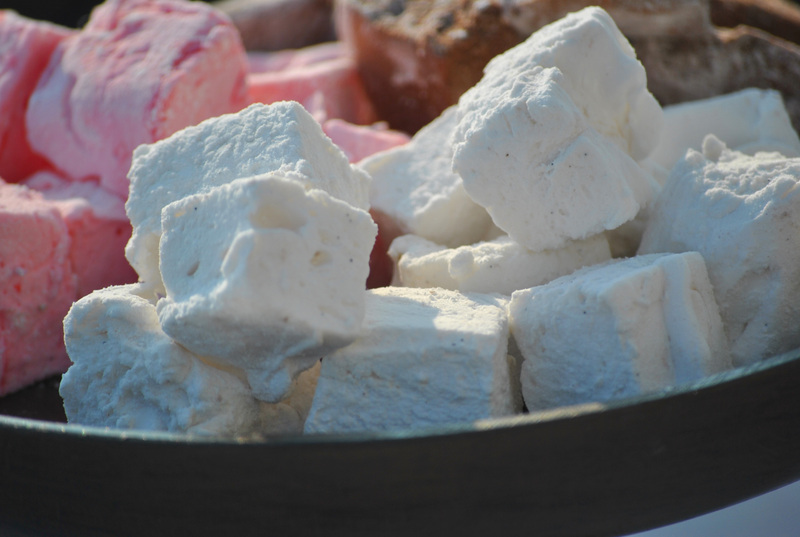 There is nothing like freshly made marshmallow. The flavor and texture are out of this world. You really need you need to have to make these is a standing mixer. That’s key. The mixing of the gelatin with the syrup takes time and a very high-speed. I line a quarter sheet pan with parchment paper for easy removal from the pan and cut it with a bread knife. Prepare a quarter sheet pan with parchment paper. Whisk together gelatin and cold water and set aside. Stir together the sugar, 1/4 C corn syrup, water and salt in a medium saucepan over high heat. Boil, stirring occasionally, until the temperature reaches 240F. Meanwhile pour the remaining 1/4 C corn syrup into the bowl of an electric mixer fitted with the whisk attachment. Once the syrup gets close to the 240F temperature (about 230F), microwave the gelatin on high until melted, about 30 seconds. Pour the melted gelatin mixture into the mixing bowl. Set the mixer speed to low and keep it running. Once the syrup reaches 240F, remove from heat and slowly pour into the running mixing bowl. Once the syrup is incorporated with the gelatin, increase the speed to medium and beat for 5 minutes. Increase to medium-high and beat for 5 more minutes. Beat on the highest speed for an additional 1 to 4 minutes. How do you know how long? The bowl will be cool to the touch. Also the marshmallow will hold a soft shape for several seconds before going back into itself when you pull up the whisk attachment. In other words, not stringy and sticky, the batter flows. The marshmallow will be opaque white, fluffy and tripled in volume. Beat in the vanilla. Pour into prepared pan, use an offset spatula to smooth it into the corners. Let set for at least 6 hours in a cool, dry place. Flip marshmallow onto a cutting board. Cut into 1/2 inch squares and roll in a mixture of equal parts corn starch and powdered sugar. Once the syrup is incorporated with the gelatin, increase the speed to medium and beat for 5 minutes. Increase to medium-high and beat for 5 more minutes. Beat on the highest speed for an additional 1 to 4 minutes. How do you know how long? The bowl will be cool to the touch. Also the marshmallow will hold a soft shape for several seconds before going back into itself when you pull up the whisk attachment. In other words, not stringy and sticky, the batter flows. The marshmallow will be opaque white, fluffy and tripled in volume. Beat in the peppermint and food coloring. Whisk the cocoa, malted milk and boiling water in a small bowl until smooth. When the syrup reaches 240F, whisk the cocoa mixture into it, followed by the vanilla. Turn the mixer up to medium speed and slowly pour the sugar syrup into the gelatin mixture. Once the syrup is incorporated with the gelatin, increase the speed to medium-high and beat for 10 minutes. Beat on the highest speed for an additional 1 to 4 minutes. How do you know how long? The bowl will be cool to the touch. Also the marshmallow will hold a soft shape for several seconds before going back into itself when you pull up the whisk attachment. In other words, not stringy and sticky, the batter flows. The marshmallow will be fluffy and color of chocolate malt and tripled in volume. Flip marshmallow onto a cutting board. 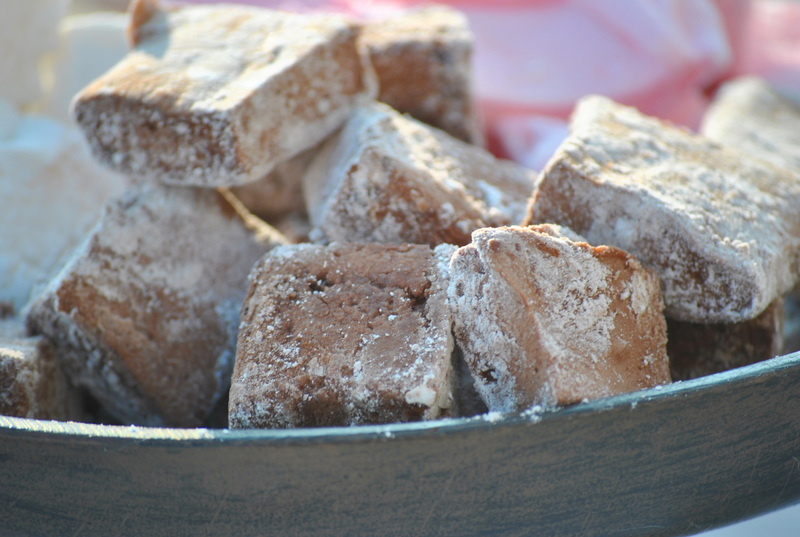 Cut into 1/2 inch squares and roll in a mixture of equal parts powdered sugar and cocoa. All can be stored in an airtight container for up to a week, or can be frozen for longer. Here is the marshmallow expert.